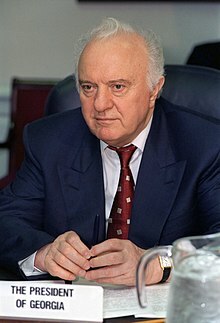 Eduard Shevardnadze (Georgie: ედუარდ შევარდნაძე, Georgie pronunciation: [ɛduard ʃɛvardnad͡zɛ]; Roushie: Эдуа́рд Амвро́сиевич Шевардна́дзе, tr. Eduard Amvrosiyevich Shevardnadze; 25 Januar 1928 – 7 Julie 2014) wis a Georgie politeecian an diplomat. This page wis last eeditit on 10 Mey 2018, at 02:16.